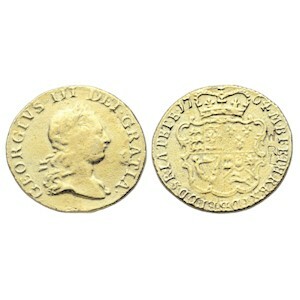 Obverse: Laureate bust of George III right, stop after III between laurel tips. Text around GEORGIVS III DEI GRATIA, separated by stops. Reverse: Crowned quartered ornate shield of arms, date either side of crown. Text around M B F ET H REX F D B ET L D S R I A T ET E. The highly abbreviated Latin legend on the reverse translates to King of Great Britain, France and Ireland, Defender of the Faith, Duke of Brunswick and Lueneburg, Arch-Treasurer and Elector of the Holy Roman Empire.